Check out this stunning case study of a Polesworth house clearance. Clearance instructions: The clients asked us to clear a house in Polesworth as its current resident was moving into long-term hospice care. Items to be cleared included decades of personal effects, trinkets, and memorabilia. The family had already removed some sentimental items such as photo albums, but the remainder was to be clearanced to prepare the house for sale. Though the house lacked rear access, the Polesworth clearance was accomplished quickly due to the garage exit and large staircases. Our professionals handled the job quickly, but with the care and tact due the situation. Though much of the house was densely packed with clutter, after checking with family, we were able to salvage enough items of value to cover most of the cost of the clearance. The garage contained several hazardous items such as paints and oils that had to be disposed of in a safe manner due to environmental concerns. Items removed included furniture, old appliances, and damaged carpets. Staff also alerted the family to some obscured items of sentimental value they chose to keep. Client feedback: The Hodges family was impressed with our ability to accomplish the Polesworth house clearance quickly, inexpensively and with kindness. The clients were particularly impressed with our ability to move large, bulky items without any damage to walls, floors and fixtures. The family was thankful that we offered free valuation and advised them to keep certain high value items rather than having us take them to finance the clearance. 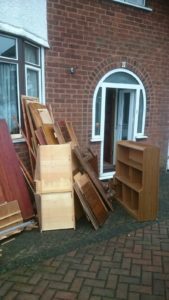 Do you require a Polesworth house clearance? We are available 9am to 8pm seven days a week and have years of experience throughout the West Midlands, including Lichfield, Birmingham, Solihull, and Sutton Coldfield. Please don’t hesitate to get in touch; we’re a sympathetic professional service with more than 30 years of experience in clearing houses of every size and style. Our services can be tailored to fit your unique needs.